As an admin of a Salesforce org on the EU2 instance, we would like to notify you of an upcoming instance refresh maintenance. In order to prepare for your organization’s continued growth, Salesforce occasionally needs to perform an activity, called an instance refresh, where they upgrade the infrastructure supporting your instance in their data centers. This will enable Salesforce to continue to provide your organization with the same levels of performance. Following this maintenance, your instance will move to another data center within the European Economic Area, and the name of your instance will change to EU8 or EU10. Salesforce will inform you of your instance’s new name approximately two months prior to the scheduled maintenance window. You can also open this article and search for your ORG ID via CTRL + F to quickly find the new instance of you org. We have reviewed the information provided by Salesforce and have come to the conclusion that you only need to take action if you reference the instance in for example custom buttons or if you retreive data like jobs, campus events and contacts via the webservice as described in this article. If you have a career website via Connexys, we will carry out the necessary change so you don't have to take action on this. Make sure other parties, for example intranet, also perform the necessary change if applicable. The endpoint you currently use to retrieve the data via the webservice, will probably refer to the instance EU2. Since this name will change, you need to change the endpoint. It is possible to change "EU2" to the new instance name (which is not known yet) after the refresh has been completed. However, you can and probably should use the custom domain that applies to your org. See this article on setting up a domain if this is not yet set up for your org. The advantage of pointing the soap address to your custom domain is that in case of a future instance refresh or org move to another instance there will be no impact on your interfaces. As an admin of a Salesforce org on the EU2instance, we would like to notify you of an upcoming instance refresh. In order to prepare for your organization’s continued growth, we occasionally need to perform an activity, called an instance refresh, where we upgrade the infrastructure supporting your instance in our data centers. This will enable us to continue to provide your organization with the same levels of performance you have come to expect from Salesforce. Following this maintenance, your instance will be served from new and improved infrastructure, and the name of your instance will change. If you follow our best practices linked below, the maintenance should be seamless. When will this maintenance occur? We will inform you of your new instance name at least six weeks prior to the maintenance. The maintenance will take no longer than four hours and your org will be available in read-only mode for the duration of the maintenance. 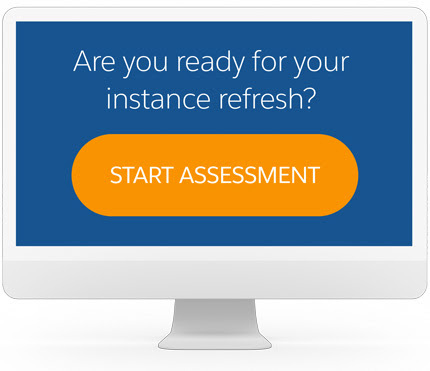 You can and should begin preparing for the instance refresh now. We’ve created a one-minute readiness assessment to help you determine what steps you may need to take to prepare. In summary, follow our best practices, outlined on the Plan and Prepare for Org Maintenance and Releases page, to ensure that you are prepared for this maintenance. 1. If you have any hard-coded references, you must update them to the subdomain that you created with My Domain. If you have not already implemented My Domain, we highly recommend you do so prior to the instance refresh. Please note, not all hard-coded references are automatically updated upon enabling My Domain. Review the Updating Hard-Coded References and Guidelines and Best Practices for Implementing My Domain articles for more information. 3. Prepare to refresh integrations if you are experiencing integration issues following the maintenance. 4. Prepare to refresh your DNS cache if you continue to see a "Maintenance in Progress" alert following the maintenance window. If you are not following our best practices prior to the scheduled maintenance window, your end users may no longer be able to access Salesforce after the maintenance is complete. Review the Instance Refresh Maintenance article for more information and frequently asked questions. 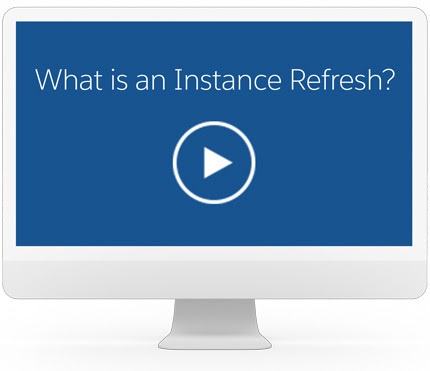 We also encourage you to watch a recording of the webinar, "How to Prepare for Your Instance Refresh". For more details and to collaborate with other Salesforce users, visit and join the Official: Salesforce Infrastructure group in the Success Community. For additional questions, open a case with Support via the Help & Training portal.